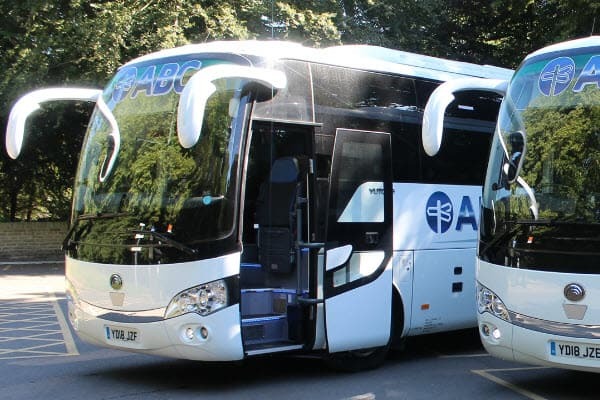 Need Coach or Minibus Hire in Stockport? Coach & Minibus hire for the Stockport area. Please complete the form below and your enquiry will be answered promptly by one of our team. A genuine family run business, established over 30 years, we have a well-deserved reputation as one of the North West’s premier coach hire companies. We change our fleet regularly to provide our customers with the highest standard of comfort by operating modern and contemporary luxury coaches, midi coaches and minibuses all fitted with the best in comfort and passenger features. Ranging from corporate & business clients, private hire for day trips and tours, airport transfers, race days and sporting events through to transport for schools and colleges. We cater for groups of all sizes. Offering from 16 seater Mercedes Minibuses through to 74 seater executive coaches. We pay close attention to every detail and are dedicated to providing world-class customer service at all times. ABC Coaches do our utmost to make your experience a pleasant one and our fully uniformed drivers are there to assist you at every step of your journey. Our modern executive coaches are fully fitted with our elegant and modern interiors. With a host of safety features including ABS brakes, engine brake retarders, lane guide with brake assist and 3 point seat belts to enable you to feel safe and secure whilst enjoying the full range of onboard executive facilities. And if you have lots of luggage these vehicles are ideal for your trip as they all have adequate space. Need any help or advice? Not sure which vehicle might be right for your needs? We’re here to help – just ask! Individual infotainment system – Passengers can enjoy their own personal and individual infotainment experience. Comfortable seats provide each passenger with their own USB charging point. Our Tourliner Coach is impressive from first glance. With its particularly generous sense of space and outstanding level of travel comfort as well as a new and clever approach to efficiency, comfort and safety. Its outstanding design, state-of-the-art interior and first-class equipment inspire passengers while making them feel right at home. The lighting concept with indirect LED lighting throughout impresses immediately and creates a pure sense of well-being. User-friendly service sets and optimum climate control with individual ventilation guarantee relaxed travel. The sophisticated design of the luggage racks is not only a visual highlight but also means they are more generously sized and easier to access. The level, platform-free floor, a wheelchair lift as well as two wheelchair spaces guarantee excellent barrier-free mobility. State-of-the-art design, contemporary colours, quality materials and a new lighting concept create a particularly harmonious sense of space, whilst at the same time setting new standards in the field of comfortable travel. Listen, watch, dream, enjoy and just simply relax. Passengers can enjoy their own personal and individual infotainment experience with the completely new multimedia world on board the Tourliner with everything that this involves – including their own USB charging point and the possibility to play back their own data. With perfected image and sound, every journey in the new Tourliner is an even more relaxing experience. The comfortable seats provide each passenger with their own USB charging point. The latest generation of the Multimedia Coach infotainment system is particularly user-friendly and also enables you to play back your own data via USB or SD card. With state-of-the-art driver assistance systems and a reinforced skeleton, the Tourliner provides the highest level of safety in every situation. It also meets the ECE-R.66.02 strength of superstructures regulation which will come into force from the end of 2017. Modern fleet offering 5 Star comfort & class-leading safety. A genuine family run business, over 30yrs experience & an excellent reputation. All of our vehicles meet the UK standards of Euro 6 LEZ they are also fitted with telematics tracking & smart witness CCTV inside & out. Friendly & helpful staff who provide a world class customer service to our customers. Competitive pricing. You’ll always get our very price possible! Powerful, intelligent systems support the driver of your Tourliner in every driving situation: as a digital assistant in the cockpit and as an automated guarantor of driving safety and travel comfort. With state-of-the-art driver assistance systems and a reinforced skeleton, the Tourliner provides the highest level of safety in every situation. It also meets the ECE-R.66.02 strength of superstructures regulation which will came into force from the end of 2017. Reliable, economical, powerful and environmentally friendly. The six-cylinder in-line engine with 375 kW (510 HP) offers an outstanding consumption-performance ratio and runs smoothly and quietly. The combination of exhaust gas recirculation EGR with the SCR filter ensures a maximum reduction of pollutant emissions. Your Tourliner coach complies with the latest Euro 6 emission standard. At the same time, the drive system achieves particularly low fuel consumption and thus ensures excellent travel economy. I wanted to send feedback to you to let you know how delighted we were with your service, in particular, your driver Jason. He has a very friendly manner and was extremely approachable. I know it sometimes may not be easy driving a coach full of young people, however, Jason was absolutely super - a star! If we book with you again (which I will ensure that we call you first for a quote) we would certainly wish Jason to be our driver. Your standard of service and coach was exceptionally good. Thank you. 61 Seat 'Tourliner' CoachA Ogden, Business Manager, St Damian's RC Science College. Called ABC Hire about a bus for a group of us, extremely helpful in the office providing quotes for me and confirming all details of the booking. The driver was extremely polite, helpful and very friendly, also arriving early, the coach was immaculate, very comfy and state of the art. Brilliant experience from start to finish with booking and the trip so will definitely be using ABC again. Fantastic. We booked a 19 seater coach to transport family and friends to my mother's funeral in the Lake District. ABC exceeded expectations in all areas. Our driver - Paul - was very polite and accommodating, dressed very appropriately for the occasion. The office staff were professional, courteous and efficient from the initial telephone enquiry to the end. Well done and so refreshing to have such good service - Thank you. A Professional & Courteous Service - Guaranteed!